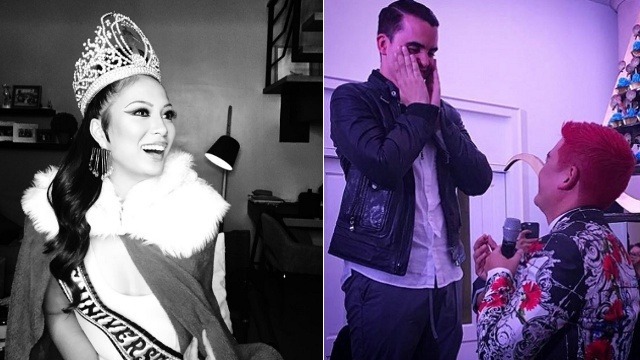 Plus, Tim Yap just got engaged! (SPOT.ph) January 19 was an eventful night for local showbiz. Isabelle Daza was one of many celebrities who were spotted at a Miss Universe-themed birthday party. Daza arrived as her mom, Miss Universe 1969 winner Gloria Diaz—and we couldn't tell the difference! Nantey West did her hair, Anthea Bueno did her beauty queen-worthy makeup, and Liz Uy helped make the entire outfit come together. Her costume even came with a Miss Universe sash and crown! That wasn't the only talked-about event that night: birthday celebrant Tim Yap also proposed to his boyfriend, Javi Martinez Pardo! Our favorite, super-sweet quote from the proposal? "When you have a good thing, you have to make it last forever."